A spike in recent news around loyalty coalitions – both good and bad – signals the dawn of a new, vastly more profitable iteration of the coalition model. Sparse claims that the model is dead are severely misinformed. Even though Plenti failed[i], Amex’s effort showed belief in the coalition model by one of the biggest names in reward programs. Powerful consumer brands, meanwhile, are building their own coalitions. Hilton allows members to shop[ii] Amazon using their Hilton point value. The “Marriott More” program allows its members to earn and redeem points on everyday retail purchases[iii]. Coalition programs are gaining steam because, managed, correctly, they solve the biggest problem in loyalty marketing: engaging your long- and mid-tail customers, rather than just 20-25% of the most frequent. V3.0: a decentralized brand coalition, enhanced by marketing technology (2017 onwards). …which have proven to deliver varying degrees of success. So for the benefit of loyalty managers reviewing their strategies, I set out here the key features and benefits of each model. In summary: V1.0 is already fading away under the joint pressures of cost and inability to deliver on promises for all partners. V2.0 and V3.0 will coexist for the foreseeable future, with V3.0 offering your best hope of earning profitable customer loyalty. The coalition model is a step up in consumer relevance to its forerunner: a single-brand, proprietary model. The single-brand, proprietary model has always been relatively homogenous: earn a flat rate of about 1% on spend, and redeem as and when. Now, think about the customer experience – taking gas stations as an example. 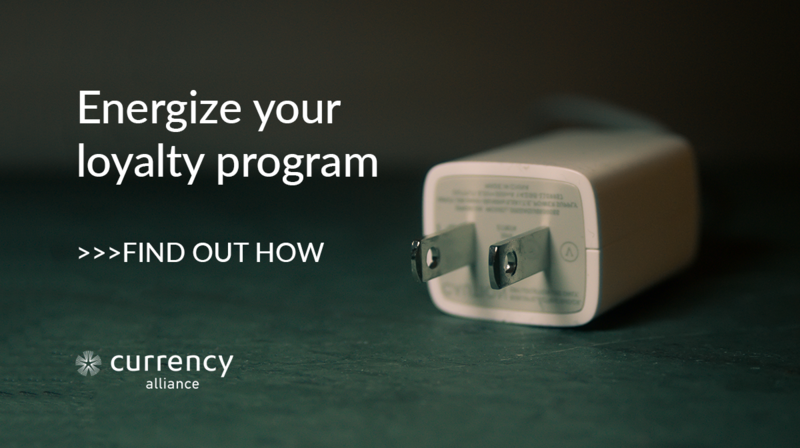 In the majority of fuel programs, you have to return to the same chain one hundred times to earn a free tank of gas. Unless you drive professionally, this would take years (and those occasional free coffees could have been had with small change from under your seat). Extrapolated across the whole spectrum of retailers, this explains why customers are tired of having a tiny number of points across dozens of programs. Those cards simply don’t earn their weight in your wallet. Click here to expand the infographic. A coalition model should solve these problems; and for a time, Air Miles (the original loyalty coalition) followed by many look-alikes, did deliver a better customer experience. It was a neat pitch: increase purchase frequency, basket size, and the capture of consumer data across many areas of spending, by creating a single loyalty coalition shared by multiple brands. One card in your wallet; dozens of places to earn and spend points. And since a third-party company had resourced the necessary technology, would manage competing brand egos and ensure that everyone benefitted, all the brands needed to do was sign up and watch the loyalty metrics soar. Typically, middleman providers of coalition loyalty V1.0 platforms siphon off 30-50% of value from their clients’ transactions. There are exceptions; Payback takes a smaller cut and reportedly sees more than 4m transactions a day in Germany alone[iv]. Flybuys is also fairly generous with rewards. But the model generally leaves too little for the program to finance worthwhile rewards for all but the most frequent customers. This is a big part of why Plenti failed. Brands have never really got access to high-quality customer insight based on data from other partners in the coalitions; and even when they did, they lacked the tools to understand and action it in a profitable way. becoming associated with undesirable brands (for the record, this is one of the core features of Currency Alliance’s platform. Each brand is in total control of their chosen partnerships). In short: mistrust, inflexibility, and cost meant V1.0 has never quite delivered on its promises. All this took place against a paradigm shift in the balance of power between consumers and brands. By early 1990s recession, the scales of demand and supply had already begun to tip in favor of consumers. Air Miles copycats began to pepper the market during the mid-1990s (Sainsbury’s, Travel Club, etc. ), but wealthier, healthier consumers became exhausted by too much marketing – and became proactively interested in forgoing their loyalty for cheaper or comparable alternatives from lookalike brands. 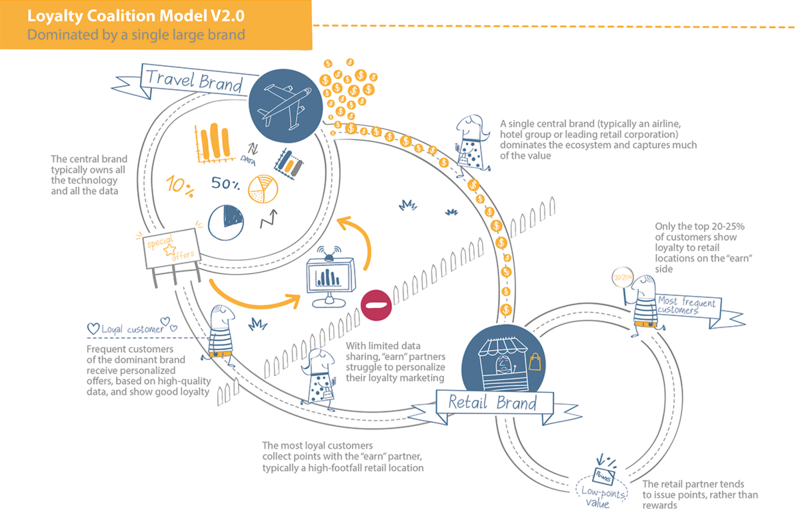 As a consequence, all but the largest retail brands generating up to $10bn a year in revenue, such as national gas stations, convenience store chains and entertainment venues, have been reverting instead to cheaper proprietary models or joining V2.0 coalitions. The loyalty coalition V1.0 is at the end of its useful life. 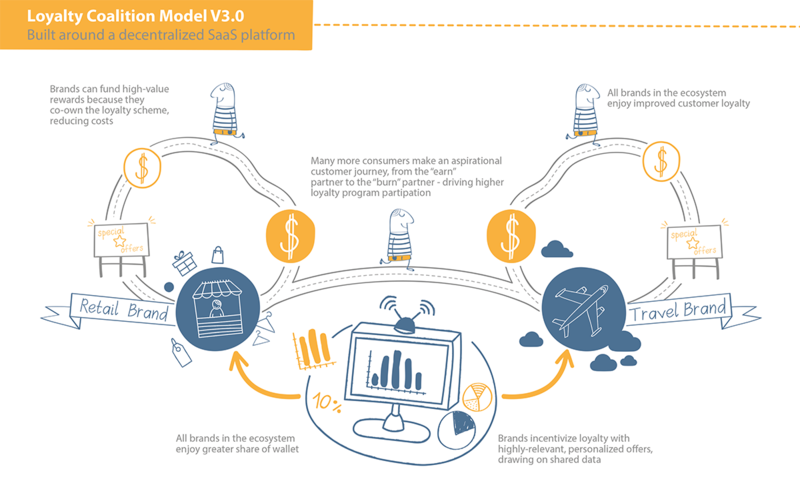 Loyalty coalition V2.0 – where a single dominant brand owns the ecosystem – was not a response to the problems of the Air Miles model. It began as the “frequent flyer program”. This isn’t a true coalition, as such; simply an ecosystem comprising airlines, car rental firms and hotel chains, in which customers can earn and spend a single points currency. These worked great for business travellers, who earned points quickly enough to be able to burn them in the same ecosystem. But for casual holidaymakers who only flew once a year, they were exciting but not very rewarding – so travel brands began to recruit retail partners with whom customers had more frequent shopping relationships. Consumers were so keen to earn that free flight, that airlines found retailers were prepared to pay 3-4 times the redemption value of those loyalty points in order to draw and retain their business. Adding partners became remarkably profitable – ushering in the era of the brand-led loyalty coalition, version 2.0. The key to the V2.0 model is that it unites brands which are naturally “earn” businesses with “burn” businesses – allowing each type to profit off each other’s strengths. In theory, a consumer can earn or burn points with any coalition partner; but in practice, only a modest number of the partners become redemption partners. Earning on groceries to spend on groceries is uninteresting. Earning on groceries to spend on a vacation – now we’re talking. Business-side, this is also highly appealing, because of the differing margins on goods and experiences. Experiences – such as spa treatments, cinema or concert tickets, etc. – are low variable cost with high margins; but as non-essentials, they’re perceived as “special” by the consumer who doesn´t think much about how much they actually cost to deliver. Your goods-based brand probably can’t do this on its own (retailers should become experience-based business, but this presents significant challenges). 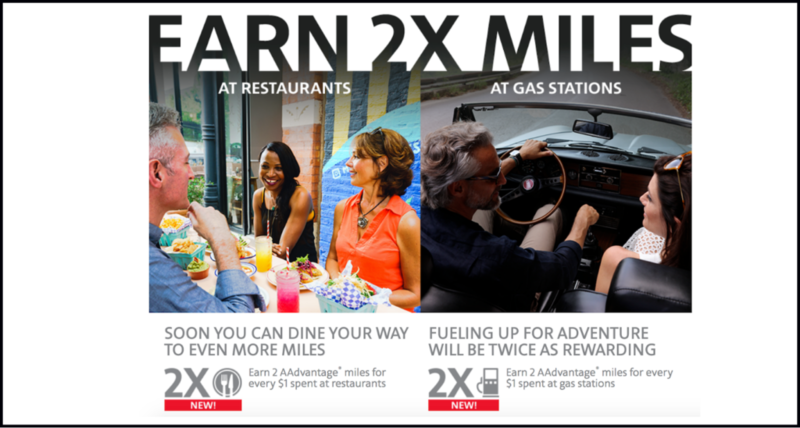 Coalitions provide the shortcut: earning engine partners in everyday spending, allied with experience providers where customers can redeem on things that motivate them to collect the points in the first place. This should serve as a further rebuttal to brands who fear their points value being gobbled up by other vendors. Ownership of the program had passed from the expensive middleman, to the self-interested lead brand, who also retains considerable margin. The owner of a typical V2.0 coalition tends to be a very large travel brand, such as Lufthansa and Hilton, or one of a small cluster of gargantuan retailers such as Tesco, whose sheer size attracts high velocity in earning. The owner enjoys enhanced profits from the greater magnetic pull of the broader ecosystem with smaller partners, and if the program needs any further system enhancements – i.e., to act on marketing data, or create expensive digital environments – they can build or buy them themselves. But what incentive is there for them to cultivate a more powerful ecosystem for their smaller earn partners? There isn´t much incentive, so for smaller partners in V2.0, you basically pay just to incentivize the customer acquisition or retention, but without the benefits of better understanding those people. 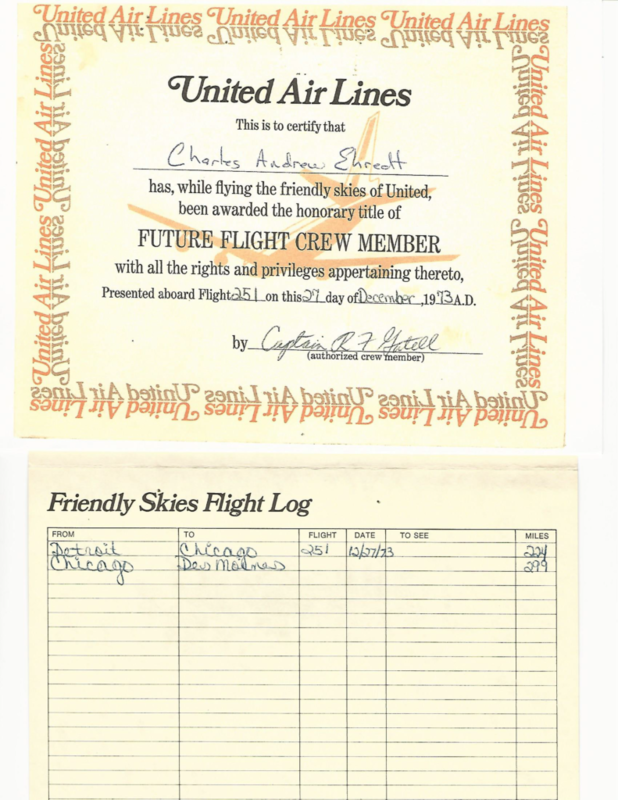 To illustrate: on my first flight with United Airlines in 1973, the Captain pinned flight wings on my shirt and presented me with this certificate. It was a cool experience; followed a million actual miles later by an even cooler one. I was sitting in cattle class, about to descend to Newark Liberty Airport, when five United Airlines flight attendants approached me and demonstrated considerable appreciation for the duration and extent of my custom. I was surprised that they knew this information in-flight, and delighted because it was such a personal touch. I also think the 10-15 people sitting around me were even more impressed. Such personal touches should become the marketing norm – but the data is rarely timely. As I was clearly a regular flyer, United could easily presume that an in-flight show of appreciation would be the right experience for me. 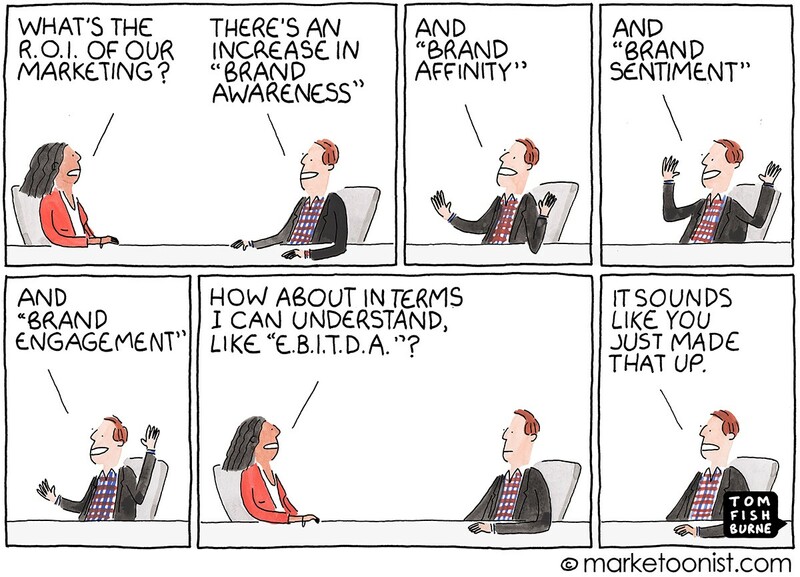 Getting this right is not easy for smaller brands. And, in the MileagePlus ecosystem, I doubt any other partner knows I am a lifetime Gold member. If you’re a coffee shop, how do you know if your reward program member would prefer a cinema ticket, a full body wax, or a museum tour? People have an inherent need to be recognized and appreciated. Tech shouldhelp, which is why the brands who can afford it, have begun plugging loyalty tech into their wider marcomms stack. Heathrow Airport’s “Greater Passenger Experiences”, delivered rewards such as upgraded car parking via CRM mailing, and recording +20% in active membership[viii]. Virgin Red – highly commended at this year’s Loyalty Magazine Awards[ix]- could have cost around $0.6m[x], based on typical costs of developing any highly functional app. But V2.0 coalition owners are largely not sharing these advancements or the underlying technology in their ecosystems, leaving a gaping hole in the capabilities of the smaller partners who can’t afford the investments in advanced complementary tech. As marketing gets more personal, it also gets more affordable – and better technology can help brands turn lingering points into incremental profit. Without actionable data, a simple points program can be a terrible waste of money: a blunt instrument which doesn’t really engender much loyalty (and also makes you look paranoid). 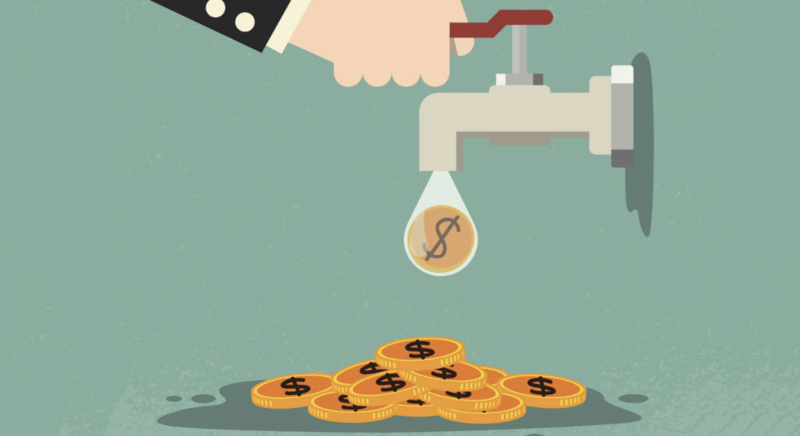 the CFO wants to reduce rewards to 1% (or less) to avoid eating into short-term margins. Neither side of the argument makes sense applied to real-world consumers. If you have clear data to indicate your customer’s preferences – whether that’s to definitely shop with you again, or to definitely never shop with you again – any percentage reward, however slight, has minimal impact. Conversely: a hotel room might have a $200-a-night face value, but the cost of cleaning it might be only $7. If it looks likely to go empty (and if the customer may order room service, pay for parking, or hit the minibar), offering the room for a redemption both creates high perceived value and is profitable to the hotelier. That loyalty currency they’re spending is already your money, after all. Marketing tech can reduce spend in other ways. Virgin Red dishes out some rewards, but also earns loyalty through fun – which is free. Ikea, meanwhile, has found that customers enjoy uncertain rewards more than certain ones[xi]– to the extent that brands can earn more loyalty by dishing out less value. What if your app allowed loyalty members to gamble their points? …what if you could win more points off other customers? By building up data across a broad swath of consumer activity, you gain the information needed to market to a segment of a few customers (or even a segment of one), and shell out less money to deliver greater-value customer rewards. Under the decentralized, Loyalty 3.0 model, brands collaborate to build an ecosystem which delivers value for every partner: capturing the benefits of a wider brand coalition, and pooling resources to power up each brands’ marketing intelligence and potential. Other brands and investor groups are actively trying to take control of coalitions still operating under Model V1.0 to enable them to evolve to Model V2.0. Sainsbury´s bought Nectar. Air Canada is trying to buy Aeroplan[xii]. Aeromexico is trying to buy Club Premier[xiii]. Market forces will continue to drive the change. And coalition partners that are not the lead brand in V2.0 will look for ways to become a peer in V3.0 to get better access to the data. The improvements of V3.0 enable what we at Currency Alliance refer to as “liquidity”: reducing friction and cost, while adding functionality and freedoms that energize the marketplace, and provide easier access to greater value for customers and merchants alike. In short: better reasons to stay loyal. In every other industry during the past 20 years, increasing liquidity has been followed by dramatic growth for every participant who could adapt to new forms of doing business. Look no further than the massive growth in financial services, transportation, or even the distribution of goods. Uber, for instance, introduced liquidity in the market for transport. Uber’s first business plan anticipated $1B in revenue if they could obtain 25% of the luxury transit segment. But beyond luxury transit, their solution introduced the liquidity required to provide or procure an easier, more flexible, more rewarding customer experience – thus opening up a much larger addressable market of both customers and suppliers. Uber generated $6.5B last year. See how wrong they were? Some surprises are great, like finding a bigger market by becoming more open and giving customers more freedom. In the existing $100bn global loyalty market, greater liquidity in earning, burning, or exchanging loyalty currencies should see a $300bn (or perhaps even $500bn) market emerge. Lower costs, fewer restrictions and greater value to customers will draw into loyalty programs, hundreds of millions more people, more willing to share their data with brands because they get greater value. That is a lot of money and a lot of useful data for partners. 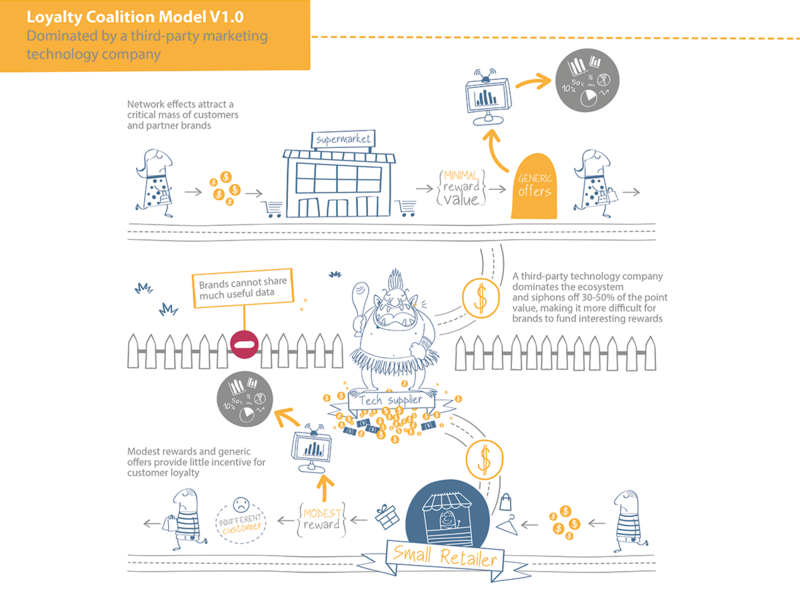 The greatest impact from the further evolution of the coalition loyalty model will be on those medium-sized and smaller brands who have largely been blocked from benefiting from V1.0 and V2.0, as V3.0 gives them access to powerful tools with which to differentiate themselves in the broader coalition and affordably acquire and retain loyal customers. There is no either/or scenario between V2.0 and V3.0; but in the healthiest ecosystems – be that in nature, business or government – no one has absolute control. Instead, animals, plants, and businesses co-exist, each striving to optimize the environment for their own benefit. We enable collaboration and selfishness at the same time so you can deliver greater value through your loyalty program. Tellingly, when Sainsbury’s supermarket bought Nectar off Aimia, it kept the coalition alive[xiv], and it continues investing heavily. Network effects are in play. The infographics included in this blog are also available as a single PDF download. You can find it here. 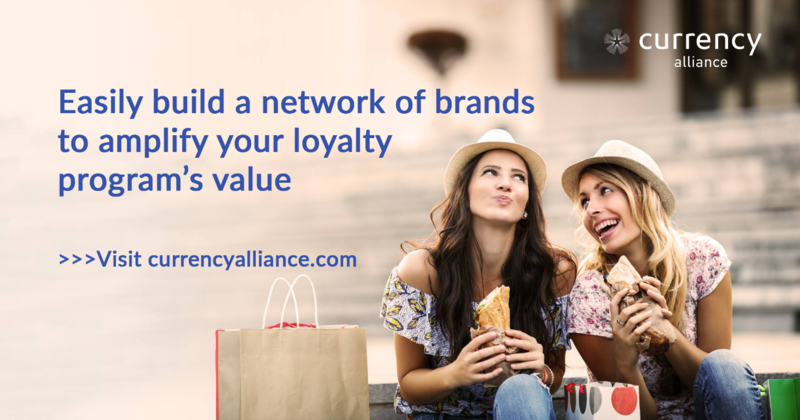 If you want to reach all your customers with your loyalty program – and not just your most frequent – Currency Alliance can help.